In 1926 the delegate of the Deutschnationale Volkspartei, Annegrete Lehmann, responded to an opponent of women’s suffrage by declaring that women needed suffrage because they were “responsible for their people,” ihrem Volk verantwortlich. This volume of essays discusses why and how right-wing women such as Lehmann participated in politics and defended that participation, even as men in their parties and movements questioned their right and ability to do so. In the period it covers, the German Right was transformed, and so was the legal status of women as political subjects. Until 1908, women were formally banned from political activity in most of Germany; then they gained the right to participate in politics but not to vote, and finally in 1918 the right to vote. This volume poses the problem of how and why right-wing women participated in politics; how gender figured in the rhetoric of right-wing politics; and what, after all, is to be considered “politics”? The editors have emphasized the interplay of organizational history, agitation and activism, and discourse and ideology in their analysis. Streubel opens the volume with a detailed and useful historiographical orientation that seeks to bring the “general” (i.e. almost exclusively male-oriented) historiography on the German Right into dialogue with work on women on the Right. In this volume, “the Right” indicates Protestant – and not Catholic – conservatism, the right wing of German liberalism, and radical nationalist and ‘völkisch’ organizations. For Streubel, this dialogue entails posing questions to both sides, especially concerning manipulation and self-mobilization of groups new to political participation mass politics. These issues have been explored intensively in general histories of the Right. Yet much of the literature on women has assumed a kind of manipulation, either by husbands or by mass politics. Historians of Right-wing women have not applied these classic questions to their material. Therefore, many questions concerning women’s political self-mobilization in the Kaiserreich and Weimar Republic remain to be explored, such as why women, long socialized against politics, joined political organizations so readily after 1908, when the ban affecting most of Germany was lifted; whether these women even meant thereby to challenge conventional gender relations; and the extent to which women joined in the radical-nationalist critique of the monarchy and in anti-Semitic politics. To focus centrally on these questions about women’s political mobilization means to take seriously women as political actors. The question of how gender figures in right-wing discourse has received some attention from “general” and women’s historians, but “general” historians have not integrated findings from research on women’s voting and party activism into their accounts of political parties or political milieux. The DNVP rested on a slight majority female vote, and even the Nazi party NSDAP drew half of its votes from women in 1932. The gender of mass politics, thematized in a 1992 essay by Eve Rosenhaft that is frequently cited in this volume, remains a tantalizing question. Are appeals to a “mass” audience in essence appeals to women? When women respond to a political appeal, is that what helps an issue over the hurdle of reaching a “mass” audience? Streubel’s introductory remarks point to the important effect of the most fruitful research on women: the way it forces a re-evaluation of historical concepts. The very definition of politics becomes interesting, for example, given right-wing women’s intensive engagement in putatively unpolitical work such as community nursing care (Diakoniepflege). But this effect is a two-way street: even as these right-wing women claimed to be unpolitical, they participated in political activities in the conventional, “male” sense, such founding the ‘Deutscher Frauenbund’, the first right-wing organization focused on political training for women. Historians of women on the Right – and indeed historians of all women – have to ask to what extent these self-empowering actions can be meaningfully defined as feminist ideology or activism. The essays in this volume tend to focus on political organizations that women claimed were unpolitical. Andrea Hänger’s essay concerns Prussia’s ‘Vaterländischer Frauenverein’, an organization that existed throughout the Kaiserreich and Weimar Republic and into the Nazi era. Along with its analogues in other German states, it made up the women’s component of the German Red Cross, offering military nursing care as well as various civilian medical, emergency, and welfare services. Its nursing and related careers seem to have drawn women who were, for various reasons, unable to take advantage of less traditional careers for women that were then becoming available. Hänger analyzes it as a putatively unpolitical women’s organization that did in fact politicize women, especially during the Weimar Republic. These women saw war in general, and the First World War in particular, an opportunity for honorable service. Defeat and then the Versailles Treaty’s ban on all military activity (including military nursing) hit them hard. The neutrality claimed by the Red Cross in its military work now morphed into a position of the ‚Vaterländischer Frauenverein’s‘ supposed neutrality vis-à-vis the Weimar Republic – a neutrality that was in fact a rejection of democracy: “Unter Berufung auf das Neutralitätsgebot des Roten Kreuzes markierte der Verein seine Distanz zur Republik und zog sich zurück in einen vorgeblich politikfreien Raum, in dem das überkommene Politikverständnis aus dem Kaiserreich unter dem Begriff des Vaterländischen, der aktuelle politische Konflikte ausblenden sollte, weiter gepflegt wurde. Er trug daher keineswegs dazu bei, demokratisches Politikverständnis bei seinen Mitgliedern zu entwickeln oder zu fördern” (p. 83; see also p. 75). Hänger’s negative formulation – “unpolitical” organizations at the very least failed to offer political training to participate in democracy to women – fits a number of other organizations and activities in this volume. Another widely shared characteristic of the ‘Vaterländischer Frauenverein’ was how its women leaders sought to maintain organizational control by asserting a specifically female expertise that could not be replaced by men. Their alienation from the Republic predisposed them to support the Nazi takeover in 1933, but Nazi rule in fact spelled the end of their organization. It was dissolved in several stages until the process was complete in 1937. Claire Venghiattis likewise highlights women’s assertion of a specifically female expertise in her essay on the ‘Frauenbund der Deutschen Kolonialgesellschaft’. That expertise became the organization’s central claim against efforts of the male-dominated ‘Deutsche Kolonialgesellschaft’ to limit the ‘Frauenbund’s’ autonomy. This was a case of gender conflict among politically like-minded women and men, and Venghiattis uses this material to argue for the presence of a “maternal feminism” (Ann Taylor Allen’s term, p. 88) among these colonialists. Venghiattis offers a clear exposition of examples of this conflict. She emphasizes the connections that existed between the German women’s movement and colonial activism, so she does not comment on the predisposition of these women to accept the Republic’s end. Ute Planert, by contrast, exmaines antifeminist women’s encounter with Nazism. She focuses on members of the ‘Deutscher Bund zur Bekämpfung der Frauenemanzipation’ such as Marie Diers and Emma Witte who followed a trajectory from antifeminism rooted in the politics of the Kaiserreich and the Weimar Republic to ‘völkisch’ anti-Semitism and Nazism. Their guiding concepts were ‘Mutterschaft’ and ‘Volk’, and for these women, ‘Mutterschaft’ was conceptualized only as service to a racialized ‘Volk’ and not as entailing rights. Their commitment to racial eugenics was, given that, consistent. Planert argues for a political genealogy of which Streubel’s “general” historians should take note (if they haven’t already on the basis of her important monograph): “Der organisierte Antifeminismus ging in der radikalen Rechten der Weimarer Republik auf” (p. 127). In its ideas and its personnel, the ‘Bund’ can be considered “protofascist” (p. 128). In both Venghiattis’s and Planert’s essays, women’s mobilization around motherhood and race led to troubling results. Nancy Reagin likewise connects claims to control a specifically female sphere with politics in her essay on “nationale Hausarbeit.” The phrase is her coinage, to denote the ideological value that conservative women placed on putatively unpolitical housework. The ‚Reichsverband Deutscher Hausfrauenvereine‘ and the ‚Reichsverband Landwirtschaftlicher Hausfrauenvereine‘ were affiliated with the liberal German women’s movement through the ‚Bund Deutscher Frauenvereine‘. Yet, like the women in the ‘Vaterländischer Frauenverein’ (which was not affiliated with the BDF), these women professed political neutrality as a cover for de facto anti-republican conservatism. Reagin demonstrates their conservatism through their stances on consumer policy and servants’ rights. Like Hänger and Planert, Reagin posits the relationship between the women in these housewives’ associations and the antidemocratic parties and the later Nazi takeover in terms of how their concept of housework as a nationalist act prepared or predisposed them to be easily mobilized by far-Right parties. Conservative women did, of course, participate directly in the political parties of the Weimar Republic. How did they fit into male-dominated political parties? Raffael Scheck’s essay turns our attention to women in local DNVP and DVP party agitation during the Weimar Republic, and usefully takes a local approach. Using the local party press in Berlin, Stettin, Stolp, and places in East Prussia and West Silesia, he asks how these parties treated women, and what women members expected from their party. Regarding the former question, Scheck takes up an argument of Helen Boak’s to explore the extent to which the parties relied on women’s work for its local agitation. He also asks what kind of political education these parties provided to women. While he finds variation among the chosen localities, he also discerns some general patterns. First, women in local party organizations saw their party work, which took many forms, as a process of making the party into a “home” and “family” – and so, contra Boak, what might look to the observer like drudgery (e.g. dues collection) apparently held deeper meaning for them. Second, except in Berlin, local party women avoided and downplayed demands for women’s rights relative to the positions of women party leaders at the Reich level. The local women countered the language of rights with that of service to others, and viewed the two languages as incompatible. This divergence alerts us to the presence of antifeminist pressure on the party leadership from its base. Scheck emphasizes the absence of barriers for these women when given the option of voting for the Nazis. Given that divergence between local and Reich-level party women, even when female party leaders criticized the Nazis for antifeminism, DNVP and DVP female members at the local level were unlikely to object to voting for the NSDAP on that score. While Scheck’s essay focuses on women in party organizing, Julia Sneeringer directs our attention to DNVP agitational rhetoric, especially that produced by women. Her essay is a part of a larger investigation into “the impacts of female suffrage on Weimar political culture” (p. 178), and here she focuses on an interesting problem: even though conservative rhetoric about women tended to link women to harmoniousness, the DNVP summoned women to “struggle (Kampf) against the enemies of the German nation and ‘Kultur’.” Yet at the same time, the DNVP “reinforced prevailing associations of women with the private by locating the source of that struggle in the nursery of the state, the home” (p. 177). Sneeringer concludes that the rhetoric of struggle was intended “to motivate the most reticent women to vote, as the party feared that its core female constituency would also be least likely to leave the private sphere to engage in politics” (p. 194). This fits with Scheck’s findings and, as it happened, the DNVP did quickly lose female votes to the NSDAP in 1932. Like other authors in the volume, Sneeringer notes that vaunted neutrality with regard to party “bickering” functioned as anti-democratic and anti-republican political education for women. And her materials show DNVP women’s use of anti-Semitism and racial eugenics (e.g. Lenore Kühn, Margarete Behm) in appeals they wrote that were directed at to women. In addition to women’s self-mobilization and participation in political parties, the volume seeks to throw light on conservative ideology and discourse. Streubel’s second essay in the volume, on the ‘Ring Nationaler Frauen’, contributes to this third theme of discourse or ideology. The ‘Ring Nationaler Frauen’ was a group of explicitly antidemocratic, politically active women in the Weimar Republic. These female “conservative revolutionaries,” including Käthe Schirmacher, Sophie Rogger-Börner, Ilse Hamel, Beda Prilipp and Lenore Kühn, were of course not as well-known as the male ones. Streubel describes them here as a specialized piece of the public sphere, a “Teilöffentlichkeit” (p. 203). Some of these women were explicit racist and völkisch thinkers, while others were not; all of them targeted liberalism as their main enemy. The ‘Ring Nationaler Frauen’ wanted to displace the liberal ‘Bund Deutscher Frauenvereine’, seeking both to claim, as the BDF had, to represent German women and strip that claim of any feminist element. The RNF did, however, advocate women’s political participation, so the problem of differentiating themselves from feminists became interestingly complex. RNF spokeswomen spoke of “new women” in a “national women’s movement” (p. 220f.) that would interpret political issues exclusively through the lens of the nation, but they also insisted on women’s participation in politics. The progress of the ‘Volk’ was only possible, they claimed, if women also progressed. Streubel argues that feminism was in fact part of the RNF, both as something to despise and to adopt. This feminism-like element emerges more sharply if one compares the female conservative revolutionaries’ rhetoric to that of their male counterparts who, far from summoning women to action, depicted them as “das schlechthin Andere, Fremde, Unverstandene” (p. 224). Streubel concludes that for the RNF, “die Liquidierung der Demokratie unter tatkräftiger Mithilfe weiblicher Persönlichkeiten galt als geeignete Rezeptur für eine Rückkehr zu nationaler Größe” (p. 226). Co-editor Eva Schöck-Quinteros contributes the volume’s final essay, on the ‘Bund Königin Luise’. The BKL, founded in 1923, was an explicitly anti-Semitic organization that excluded Jews and “Fremdrassige” from membership. As in Sneeringer’s material, we see here the language of struggle and the invocation of a state of national emergency as the reason for mobilizing women to otherwise masculine public activism. While the rhetoric was conservative, the BKL’s membership seems to have been very Weimar-modern regarding women: 80% of its members were women who worked for pay. As in Hänger’s essay, we see how an organization that greeted the advent of Nazi rule nevertheless fell victim to it; the BKL was dissolved in 1934. Schöck-Quinteros juxtaposes the facts of the organization’s program and its memory years later (based on interviews with former members) in a way that highlights the long-term effects of claiming one’s activism as unpolitical: “Tausende Frauen und junge Mädchen hatten die Akteurinnen des Bundes Königin Luise jahrelang in eine Bundesgemeinschaft integriert und sie auf eine antidemokratisch, antiparlamentarisch, militaristisch, rassistisch und antisozialistisch gedachte ‘Volksgemeinschaft’, auf das kommende ‘Dritte Reich’ vorbereitet. Eine offene Frage ist noch, welchen Weg diese Frauen im ‘Dritten Reich’ eingeschlagen haben. In der Erinnerung ehemaliger Mitglieder blieben nur das blaue ‘Dienstkleid’, harmlose Vergnügungen und karitative Arbeit haften” (p. 268). This volume, as befits its emphasis on women as political actors, does not take up what conservative women did under Nazism; rather, its focus is on women as political actors under conditions of partial, then full political freedom. This volume is not in itself pioneering, but the monographs that have already appeared by six of the eight authors (Streubel, [Süchting-] Hänger, Planert, Reagin, Scheck, and Sneeringer) are. This volume is, rather, an efficient orientation to German women on the Right by those who are among the best qualified to provide it. It includes 55 pages of primary sources that were referenced in the essays, a wonderful idea that functions very well. Two of the essays (Venghiattis’s and Sneeringer’s) are in English. However, those essays’ lengthy quotations were kept in the original German, which I mention here lest English-speaking prospective readers assume that no knowledge of German is necessary to read those essays. Given that editorial decision, I think it would have been better to keep the shorter quotations in German as well, but Sneeringer especially was inconsistent here. 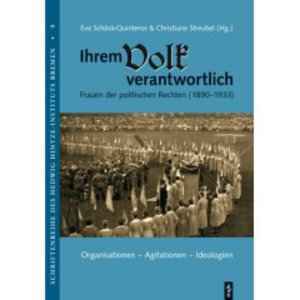 “Ihrem Volk verantwortlich” is a thoughtful and stimulating collection. Lora Wildenthal: Rezension zu: Schöck-Quinteros, Eva; Streubel, Chrsitiane (Hrsg. ): Ihrem Volk verantwortlich. Frauen der politischen Rechten (1890-1933). Organisationen - Agitationen - Ideologien. Berlin 2007 , in: H-Soz-Kult, 15.01.2009, <www.hsozkult.de/publicationreview/id/rezbuecher-10868>.